(Screenshot from ABC News footage)Watched by U.S. President Donald Trump, Pope Francis blesses a rosary for First Lady Melania Trump at the Vatican on May 24, 2017. Pope Francis urged U.S. President Donald Trump to be a peacemaker at their first meeting in the Vatican, but he was not all smiles throughout their meeting. Trump had spoken sharp words about the Pope during the U.S. election campaign last year, but received a tribute from the Swiss Guard in a Vatican courtyard when he arrived on May 24. "It is my desire that you become an olive tree to construct peace," the Pope said, speaking in Spanish, Reuters reported. Francis once said that Christians must have "cheerful faces and eyes full of joy," The Guardian wrote, noting such emotions seemed absent when Trump descended on the Vatican. The meeting was ultimately considered a success following the rocky start to the pair's relationship last year, when the Pope was seen to have questioned Trump's Christian credentials. But despite a warm trading of gifts and humorous exchange between Pope Francis and the first lady, Melania Trump when the Pope asked if she fed him a popular kind of Slovenian cake – the meeting was notable for the somber tone at the start. Francis gave Trump a signed copy of his 2017 peace message titled "Nonviolence - A Style of Politics for Peace," and a copy of his 2015 encyclical letter on the need to protect the environment from the effects of climate change. "Well, I'll be reading them," said Trump who has made a number of utterances at odds with the notion that climate change is caused mostly by human activity. When the two sat at the pontiff's desk watched by photographers and reporters, the Pope shunned the typical small talk that usually occurs before the media is ushered out. Last year the Pope said a man who thinks about building walls and not bridges is "not Christian," seen as a sharp reprimand for Trump's pledge to build a wall along the U.S. border with Mexico, Reuters reported. The Pope and President talked privately for around 30 minutes with translators present. 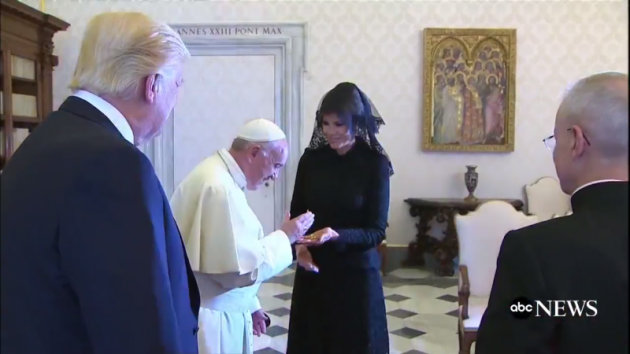 When first lady Melania Trump accompanied the President to his meeting with the Pope, she wore a black long-sleeved Dolce and Gabbana dress with a veil. Trump's daughter and White House adviser Ivanka Trump was also dressed all in black with a head covering, ABC News Australia noted. "Per Vatican protocol, women who have an audience with the Pope are required to wear long sleeves, formal black clothing, and a veil to cover the head," Stephanie Grisham, the first lady's communications director, told CNN. Days earlier, during her visit to Saudi Arabia, a strict, conservative Muslim theocracy, the first lady avoided the customary headscarf, but arrived at the birthplace of Islam wearing a black suit reminiscent of the abaya worn by most women there. Despite not covering her head, the first lady's outfit earned her glowing reviews quoted in the local press that lauded her responsiveness to the country's culture. When asked why she wore a veil at the Vatican but overlooked a head covering in Saudi Arabia, Grisham said there was no request nor requirement for such attire from that country.